I never thought that I would find myself drinking blue cocktails, much less admitting to drinking them. But I have been, and I'm coming clean about it. The drink is called the Wallis Blue, and it's actually quite good. 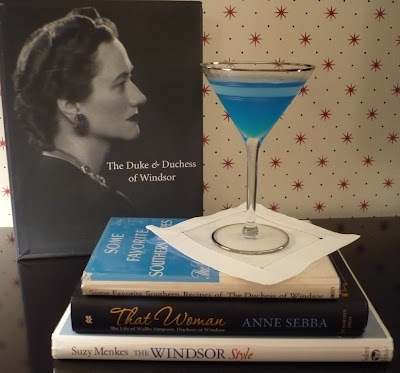 I can only assume that the Wallis Blue was named in honor of Wallis Simpson whose signature shade of blue was referred to as "Wallis Blue". I can't find any information as to when it was created nor who concocted it. The drink consists of gin, lime juice, and blue curaçao. When I mix my Wallis Blues, I use DeKuyper blue curaçao as the man at the package store told me it was the best. I wasn't about to question him; I just wanted to get out of the store as quickly as possible without anyone catching me with a blue liquor. The other nice thing about that shade of blue is that it's perfect to serve for Fourth of July festivities. Your guests might question your choice of cocktail at first, but one sip will convince them that one shouldn't judge a cocktail by its color. Shake all the ingredients together with ice. Pour into cocktail glasses whose rims have been rubbed with lime pulp. And if you like a sweet touch, dip the rims in castor sugar. 'Trixie' is always a great compliment to a refreshing beverage. I agree! "Trixie" is one of the most flattering wallpapers around. Love the recipe book! It's especially funny when you know that she NEVER cooked! I agree! What a hoot. The book is quite humorous if you read it knowing that she didn't cook. Adoring this! I'm hosting a cocktail party next month and this post kicked some fabulous inspiration for the theme. Blue cocktails, here we come. Give us an update after your party. Would love to hear what other blue drinks you served! “Wallis Blue,” a pale tourmaline shade that matched her eyes, was coined by the Parisian couturier, Mainbocher, who designed her wedding dress. Linda, Thank you. I assume this drink was made to commemorate her wedding and her Mainbocher dress. By whom, I haven't a clue. I guess this is a great drink if you're a fan of the woman who caused the abdication crisis, was a Nazi sympathizer, and was an all-around horrible person. If you must have a blue drink. Have a Blue Hawaiian. Elvis was a much better person than Wallis Simpson. I don't doubt for a minute that Elvis was much kinder than Wallis. I would be willing to serve this drink to close friends, but only if I think they'll understand it. I bet that most people would actually appreciate the taste of it, but only if they can get over the blue color! I forgot all about those red punch fountain things! Wonder if you can still find them around? And what's funny is that when I took the photo, I wasn't even planning to use it for a 4th of July post! This sounds yummy to me. Cheers! hope you have a lovely holiday. Thank you Dervla! Hope you have a Happy 4th!! How fun! I recently came across a recipe for a Blueberry Martini that also called for Blue Curaçao and was intrigued. I'll have to do a taste test! oh this is great! I do love Wallis Simpson, I am truly facinated by her fastidious style. I've only ever drunk one "blue" cocktail, a Bluebird. It was very, very pale blue and very, very delicious. I had it at a restaurant in DC and haven't found a recipe that approximates what the menu said was in the drink, but I know it had St. Germain in it. Obviously in addition to blue curacao. Yummy - I'll have to try some other blue drinks, but probably in my house! The Bluebird cocktail sounds delicious!